The Fall SSMU Special General Assembly. 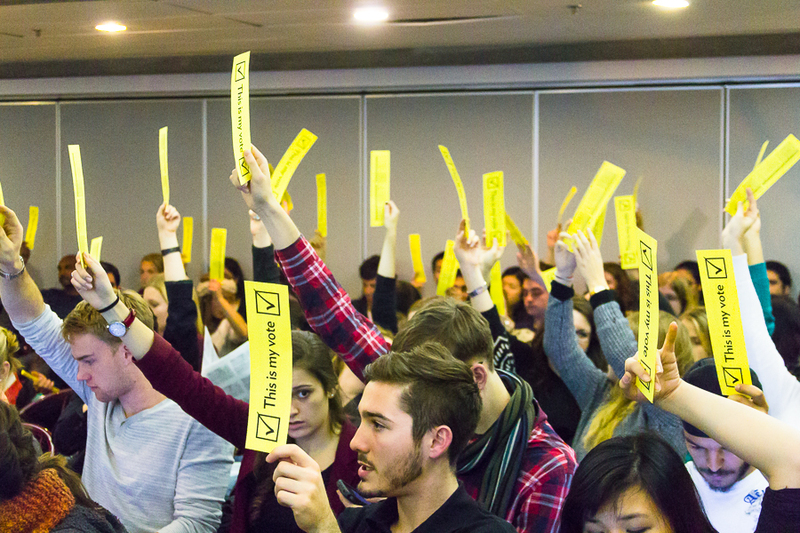 On November 14, the Students’ Society of McGill University held a Special General Assembly. As their bi-annual Fall GA did not reach quorum, SSMU was unable to approve nominations to their Board of Directors, and could not greenlight an auditing firm. The Special GA reached quorum, and was able to approve both the nominations to the Board, as well as the choice of auditing firm. These were the only two motions on the agenda – afterwards, Josh Redel, the manager of the new Student-Run Café (SRC) slated to open in January, presented and took questions on the SRC. Redel explained the business model of the SRC, and took questions on things such as menu choices, financial sustainability, and environmental sustainability. During the Question Period for the SSMU Executive, VP Internal Brian Farnan was asked how SSMU lost $21,000 on this year’s Frosh. Farnan explained that it was mainly budgeting mistakes, new initiatives, and mistakes with sponsorship. He added that next year, the $200,000 for SSMU Frosh will not be handled just by students anymore, but will be put into the hands of SSMU’s accounting department.